This week, the Centers for Disease Control and Prevention (CDC) issued an interim report on the effectiveness of this season’s flu vaccine in the United States. Because these reports will be cherry picked for data by vaccine denialists (and may cause vaccine supporters to worry about their support of this particular vaccine), I want to look at the data carefully, and make sure we understand what is exactly reported. For both influenza A and B, the key risk group of 6 month-17 year olds, the effectiveness was 64% with a 95% confidence interval of 51-73%. During the week of February 9, 2013, approximately 147 out of 100,000 Americans aged 0-4 years were hospitalized because of the flu. And already 64 children have died this year. So, if you can reduce the risk of hospitalization of hospitalization and death to your children by 64% (and possibly more), then those odds are outstanding. The effectiveness of the vaccine is much higher for the B subtype than the A subtype by a significant margin. Overall, the vaccine show 67% effectiveness for B and 47% effectiveness for A (H3N2). Because scientists and vaccine manufacturers must make a scientific assessment of what particular phenotype of flu virus will be prevalent in each area of the globe before the flu season starts, because it takes time to develop, manufacture, test and distribute the vaccines, they sometimes don’t get it right. But, again, given the serious risk that the flu has for certain groups, 47% effectiveness is still better than 0% effectiveness, unless you’re a proponent of the Nirvana fallacy. One troubling statistic is that the vaccine is only 9% effective against for individuals >65 years old against Influenza A. Again, the vaccine is still effective against the B type, but the data is troubling, except, if you look at the 95% confidence level, the numbers are huge. Part of the problem is that the sampling population is small. However, a recent study of the same vaccine in Denmark appears to confirm the weakness of the vaccine for the A subtype in the elderly. Of course, this is how science works, propose a hypothesis (how does the vaccine work with various age groups), find an answer (it may not work), propose future changes that may improve the effectiveness, and retest the hypothesis. The CDC, in its report, wants to make it clear that there are some issues with this data. I heard a news report just a few minutes ago that blared “the new flu vaccine is only 9% effective for the elderly” without any other explanation about how it works for anyone else, or a further discussion of the data. The observational study design has greater potential for confounding and bias relative to randomized clinical trials, which prevents those factors from usually influencing results. Although these midseason vaccine effectiveness estimates were adjusted for potential confounding variables that the CDC had previously identified, additional confounding factors, including health-care–seeking behavior, differences in functional status, and severity of illness, which could influence effectiveness estimates in the end-of-year reports. The CDC made no adjustment for chronic medical conditions, because of a lack of medical record data for interim analyses, which has a strong effect on vaccine effectiveness, especially on older patients. However, vaccine effectiveness estimates were adjusted for self-rated health, which is associated, albeit imperfectly, with chronic illness and mortality risk. The immunization status of young children and vaccine product information also were unavailable for this interim analysis. As more patient data becomes available for the study group, the vaccine effectiveness estimates can change. So there it is. The vaccine is very effective against Influenza B. It is fairly effective for type A, except for the most elderly. And for young children, the overall vaccine effectiveness of 64% (with little or no risk from the vaccination itself) is simply the best thing around to prevent a child from ending up in a hospital, or dying. I cannot see a logical argument that uses this CDC data to convince anyone to stop getting the current flu vaccine. But I’m sure someone will try. Bragstad K, Emborg H, Kolsen Fischer T, Voldstedlund M, Gubbels S, Andersen B, Molbak K, Krause T. Low vaccine effectiveness against influenza A(H3N2) virus among elderly people in Denmark in 2012/13 – a rapid epidemiological and virological assessment.Euro Surveill. 2013 Feb 7;18(6). doi:pii: 20397. PubMed PMID: 23410258. Centers for Disease Control and Prevention (CDC). 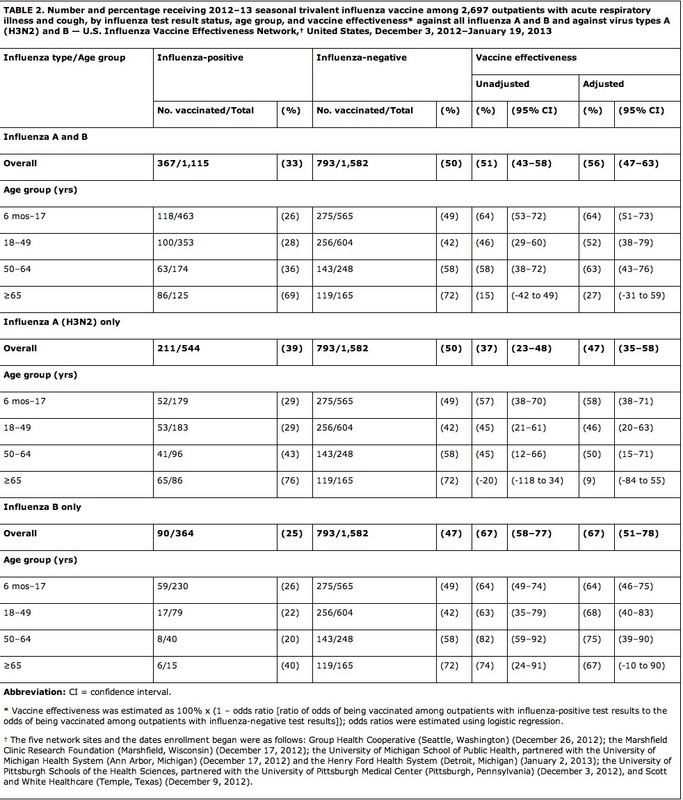 Early estimates of seasonal influenza vaccine effectiveness – United States, January 2013. MMWR Morb Mortal Wkly Rep. 2013 Jan 18;62:32-5. PubMed PMID: 23325354.